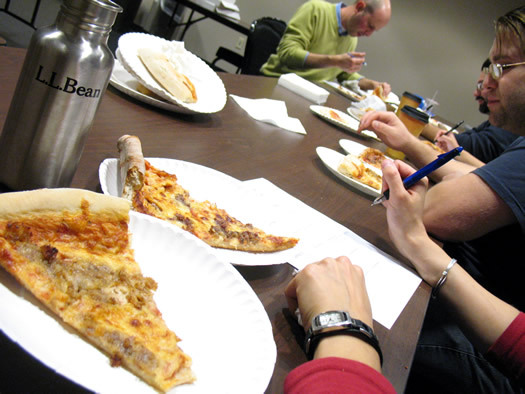 After this week's final in the 2009 Tournament of Pizza, sponsored by Sunmark Federal Credit Union, we talked with the judges about the highlights -- and the pizza places they would have liked to have seen in the field. And, yes, the video includes an appearance by the mysterious Albany Jane -- though we've protected her identity. There's also a cameo by Otto, AOA's office dog. And RenÃ©e might have done the robot. 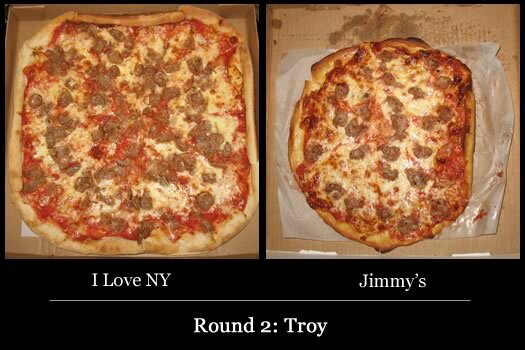 Nunzio's -- the champion of the Saratoga bracket -- charged into the final round with a 75 in its broccoli-ricotta showdown with Troy's I Love NY. That's the second-highest score in the entire tournament. Who had the best score? 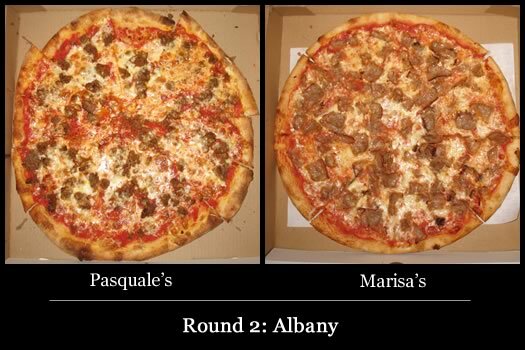 Yep, that's right: Pasquale's, last year's champ, whose sausage pizza in Round 2 score an 80. The New Scotland Ave shop narrowly knocked off Schenectady's Marino's 58-54 in the semifinals. So, this is it. 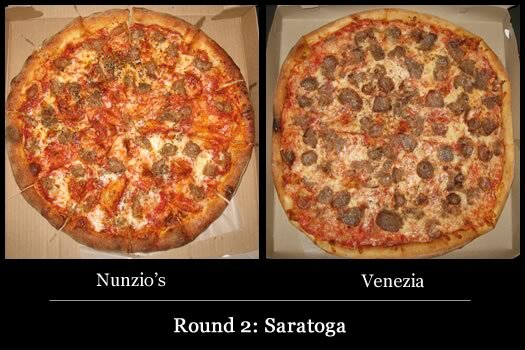 In this final matchup the pizzerias get to choose which pizza they'd like to send into competition. And, as one judge commented, the choices by Nunzio's and Pasquale's were "ballsy." We wouldn't have it any other way. Let's eat. Here's a quick recap of how the tournament got to this point. Pasquale's and Nunzio's posted tournament-high scores in Round 2 (80 and 74, respectively). Can they make it through this round to meet in the finals? 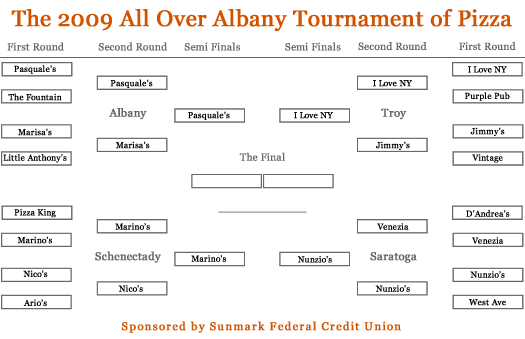 Results in the semi-finals of the 2009 Tournament of Pizza, sponsored by Sunmark Federal Credit Union, come out of the oven Tuesday. The semi-finals will be a contest of broccoli-ricotta white pizzas. First, how we got here. Pasquale's bested The Fountain, its New Scotland Ave neighbor, 63-47. Marisa's topped Little Anthony's 62-43. So, the stage is set for quite the showdown. Pasquale's is the tournament's returning champ. Marisa's is a favorite of local food bloggers. 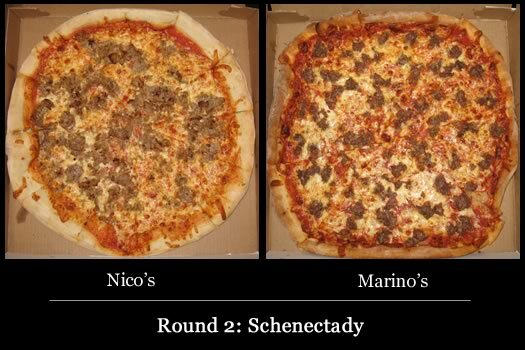 Both pizza places had almost identical scores in the first round. Lined up for a big win? Maybe not. First, the path leading here. I Love NY was able to top 'Vliet favorite The Purple Pub 63-54. Jimmy's squeaked into the second round on the first tie-breaker in a 39-39 grudge match with Latham's Vintage. So, you gotta think I Love is the big favorite here. Will things hold to form? 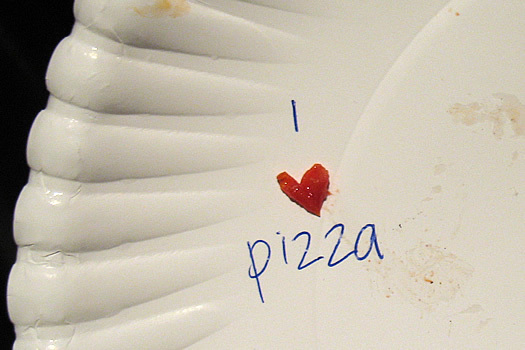 That's why we eat the pizza. So, who wants the crown? First, a quick recap of how we got here. Nunzio's topped its fellow west sider West Ave 67-52 on the strength of its crust. Venezia, out of Clifton Park, upset D'Andrea's, last year's bracket winner, in a stunning 51-18 victory. Can Venezia keep up the momentum? Will Nunzio's post another strong showing? 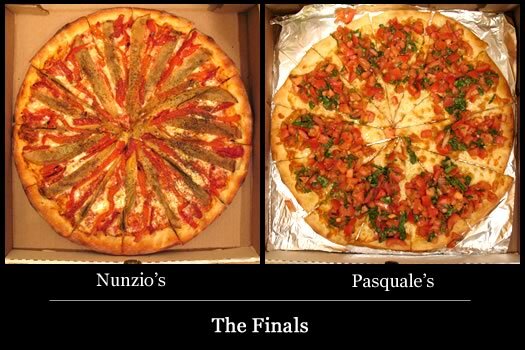 Will Pasquale's be best of the bracket again? Can the neighborhood favorite take down last year's tournament champ (and New Scotland Ave neighbor)? Will Marisa's represent for the suburbs? Will Little Anthony's play big? There's only one way to find out. Let's eat! Can the Watervliet tradition topple last year's bracket winner? Will the 'Burgh represent against Latham? Will the King reign again? Can Nico's hold off its competitor from Route 7? Will the Pizza King -- #2 in the entire tournament last year -- reign again? Can defending bracket champ D'Andrea's hold off a challenge from the suburbs? Who will prevail in a showdown of westside shops? Two ingredients are needed for the Tournament of Pizza: pizzas and judges. Here's the lineup of pizza places in this year's Tournament of Pizza, sponsored by Sunmark Federal Credit Union. The panel of judges, which has been expanded this year, is after the jump. Also: a little bit about the tournament's new scoring system. Sixteen pizza places. Thirty pizzas. Hundreds of slices. One winner. Fire up the oven. The Tournament of Pizza, sponsored by Sunmark Federal Credit Union, is back.